Kickstarter provides a great opportunity for entrepreneurs to have their ideas funded by consumers before they launch. However, most entrepreneurs struggle with Kickstarter marketing. Only 1/3rd of projects launched in Kickstarter reach their funding goal. Out of 323,978 launched projects, less than 20,000 managed to raise $20,000 or more. At first glance, Kickstarter seems simple: just place your idea/product on it and the funding will roll in. The truth behind highly successful campaigns is far from this. Marketing is the blood of any successful Kickstarter marketing campaign. Certain actions need to be executed before and during launch. Notably, campaigns which exceed their funding goal have a powerful marketing campaign behind them. A successful Kickstarter marketing campaign is something you can build on for your next product launch, and make it an almost certain success (more on that later). 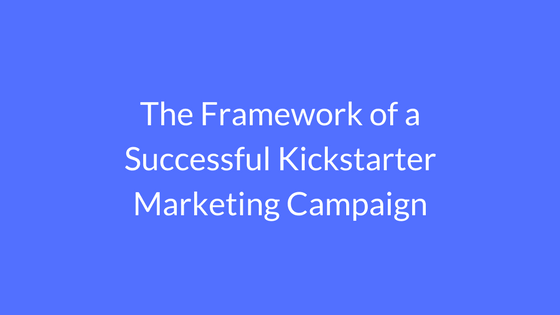 Taking the above into account, I decided to lay out the framework for a successful Kickstarter marketing campaign in this post. Interestingly, the actions and plans constructed during the pre-launch phase act as the foundation for your entire campaign. Much like you wouldn’t build the foundation of a house using porridge, it is vital that you execute well before launch. Firstly, you need to ensure that the content assets for your campaign are strong. Below are the assets which need to be in place. It is better if you show it in use rather than on its own. Prospective backers need to be able to imagine themselves using it. If you don’t have a prototype, hire a graphic designer to create mockups for you. Your project description should entice people to back you. The best project descriptions are packed with benefits and show the impact it will have on the lives of consumers and how it is different to anything else out there. People like to back innovative ideas which make them feel as if they are helping to launch something great. If copywriting isn’t your strong point- outsource this. Make a list of organisations, charities, companies and influencers which align with your project. You will need to take the time and craft a tailored email to each one on your list. Send them another email on launch day. Multiple shares on launch day will provide you with the fuel you need for a successful campaign. Getting the press on your side can make a big difference. Most entrepreneurs only focus on magazines, newspapers and tv stations. However, you can get great results by pitching niche websites which match your project. Some websites aren’t mainstream but have a dedicated fan base. The dedicated fan base of such websites can give you a big push in backers on launch day. This will cause Kickstarter’s algorithm to promote you and also add credibility to your project. You need to create a range of content for your project and promote them in a strategic manner. For instance, SEO optimised blog posts enable you to get free traffic and direct it towards your Kickstarter project page. Moreover, you could guest blog on sites relevant to your project and link them to your project. This will help to increase the number of backers, and drive hype. It is worth ‘reverse engineering’ successful projects similar to yours in order to strengthen your Kickstarter marketing campaign. It is worth taking a look at the websites and influencers which showed an interest in their project. Check out their social media and make a list of the people who shared their posts and wrote about their project. Ideally, you are trying to break down all their traffic sources and audience. This allows you to build a targeted list of the websites to contact prior and during the campaign. If you time this well and are strategic, you will get a flood of backers during your project. Facebook video ads enable you to target the right people and attract them to your campaign. Some of them won’t take any action on your Kickstarter page. It is worth using link tools such as Snip.ly so that you can collect data about how long people are spending on the page and carry out a remarketing campaign so that they take action. With Facebook marketing for Kickstarter, it all comes down to the targeting and choice of ad image. This can make or break your campaign. Compelling videos get a lot of engagements. This reduces the CPM (cost per thousand impressions) of your Facebook ad, thereby enabling you to reach more people. After launch, it is vital that you maintain communication/relationships with people you contacted during the pre-launch phase. Some won’t reply to your messages because they want to see evidence of results first. Therefore, as your campaign gains traction, you should keep them updated with how it is going. Encourage backers to share the project with friends and ask you questions. You can use the questions to improve your project description and outreach. Chances are others have exactly the same questions. A good project description leaves no stones unturned and breaks down any doubts. As you can see, launching a successful Kickstarter marketing campaign can be stressful, time-consuming and complex. Leverage my time and experience in order to launch successful Kickstarter marketing campaigns. Feel free to get in touch.